On the agenda for the weekend is to dye Easter eggs with my preschooler. 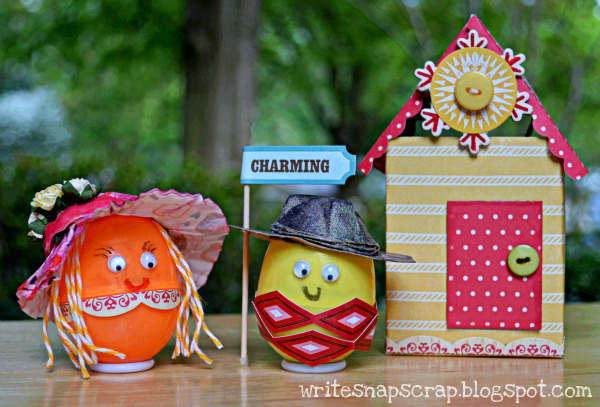 But before we tackle real eggs, I thought it might be fun to decorate some plastic ones. I saw a feature in Disney’s Family Fun magazine of plastic eggs sporting a variety of hats and thought I’d follow suit. May I introduce Mr. and Mrs. Egghead? These two are obviously Southerners, maybe Texans, given their headgear. I made Mr. Egghead’s cowboy hat using a paper egg carton, a small piece of cardstock and a bit of twine. 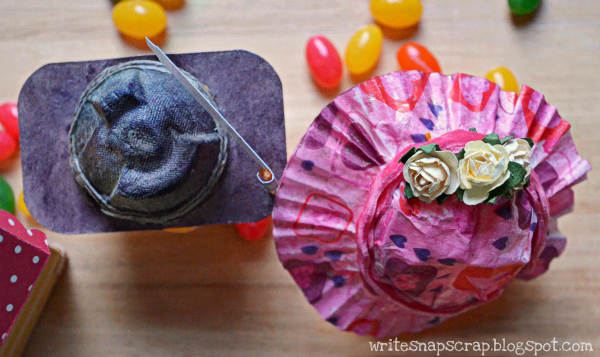 I made Mrs. Egghead’s Easter bonnet from a cupcake wrapper, felt trim and small paper flowers. The couple is sporting border stickers from Echo Park’s This and That collection. 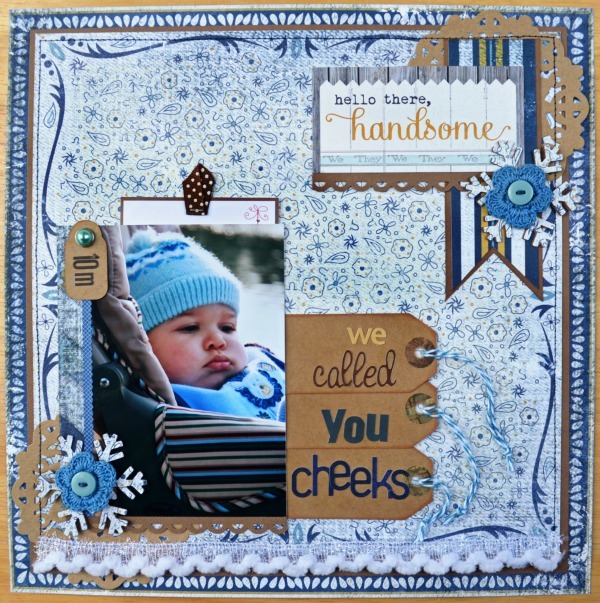 I thought the red triangle border sticker looked a bit like a bandana and suited our cowboy. I used a scallop border sticker for Mrs. Egghead to mimic a dress collar. I also used stickers and paper from This and That to build the house. The roof and door are Cosmo Cricket. They’re just about ready for Easter, I’d say. 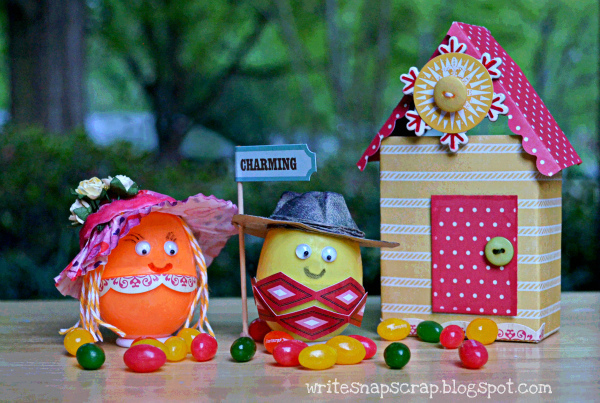 Have you decorated eggs yet this year? If so, feel free to link them in the comments here or on the Paper Issues blog. Our current theme is Candy Shop. We’d love to see your projects. 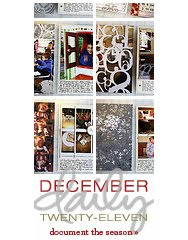 Paper Issues also has a great giveaway on its blog. Saturday is the last day to enter. I was so excited to finally get a box of October Afternoon’s Sasparilla in the mail. It’s such a fun and engaging line and I dug in the box right away to make something. I love the journaling cards that come with every OA line and as I fanned through them, the card that read, “Country Roads” struck me immediately. I believe that may be due to my childhood love of John Denver. Way back when, kids had portable record players and LPs and the first album I remember spinning on my red, plastic record player was by John Denver and in particular, the song, “Take Me Home, Country Roads," which I played over and over. 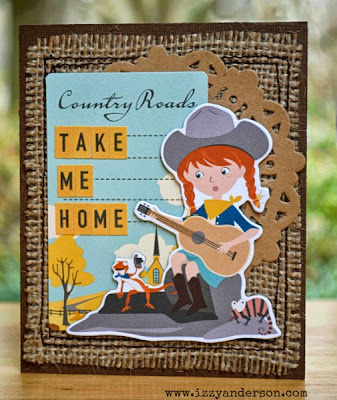 So, armed with the Country Roads journaling card, some mini market alphas and a cute chipboard sticker of a pigtailed cowgirl strumming a tune, I had the basis for a card. 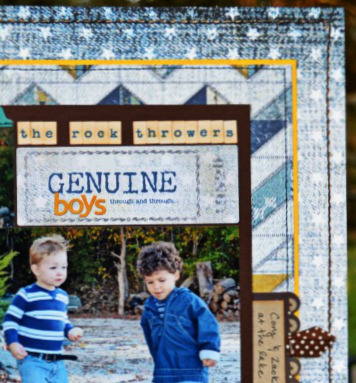 Underneath, I added a kraft die cut and some burlap for a bit of texture and sewed it all together. For my second card, I again used burlap as the base for a card front. This time, I paired the burlap with yellow and teal for a pop of color against the warm brown cardstock and patterned paper. Burlap makes me think of Autumn and I went with a Fall theme here. 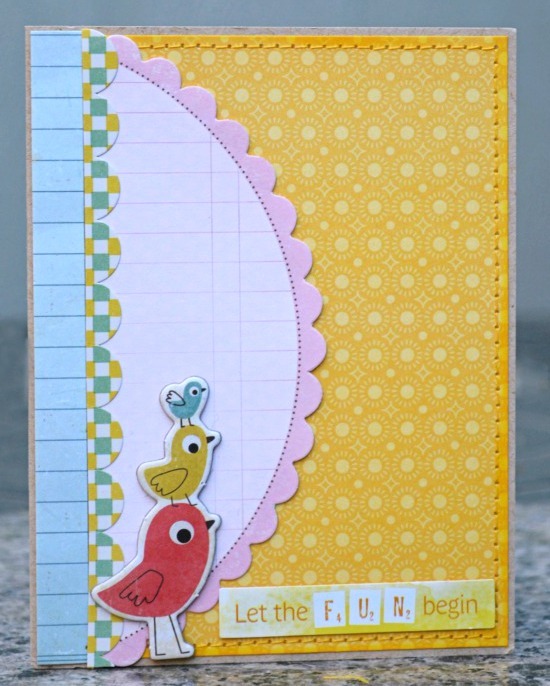 The patterned paper and teal button are Little Yellow Bicycle, the “enjoy” sticker is October Afternoon and the chipboard pumpkin is Bella Blvd. 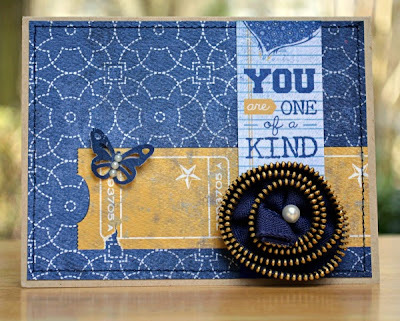 This was my first time using burlap on cards and I found it really fun to use. 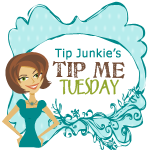 Burlap’s a great neutral base and I love the texture it gives. 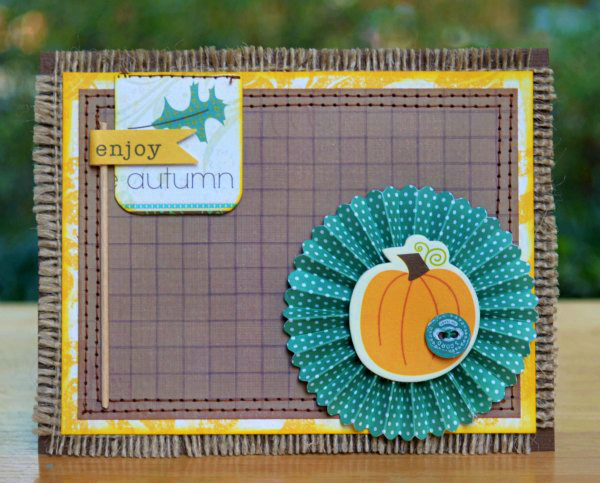 If you’ve made cards or projects with burlap, feel free to link them in your comments. I’d so love to see what you’ve done. We’re having the most beautiful spring here in North Carolina. The sun is out. The flowers are blooming and all over the neighborhood, I hear the hum of lawn movers. On days like this, it’s impossible not to find myself wanting to create something bright and sunshiney. 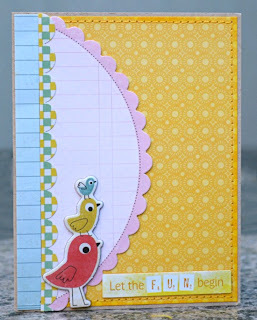 The first card, "Let The Fun Begin," is a hodge podge of stuff laying on my desk and things I eyed on my Clip-it-up. This project started life as a color challenge to use yellow and pink. That’s where I got the yellow base (Pink Paislee’s Hometown Summer) and large pink scallop (Making Memories journal book). Then I started poking around my desk, adding this and that. I had just gotten a 6x6 pad of Crate Paper‘s new Storyteller and I pulled the blue ledger from there. On top, I added a scallop border sticker from Studio Calico, a bit of twine from The Twinery and a trio of Crate chipboard birds. The sentiment sticker is from Amercan Crafts's new Dear Lizzy Neapolitan line. Love that collection! 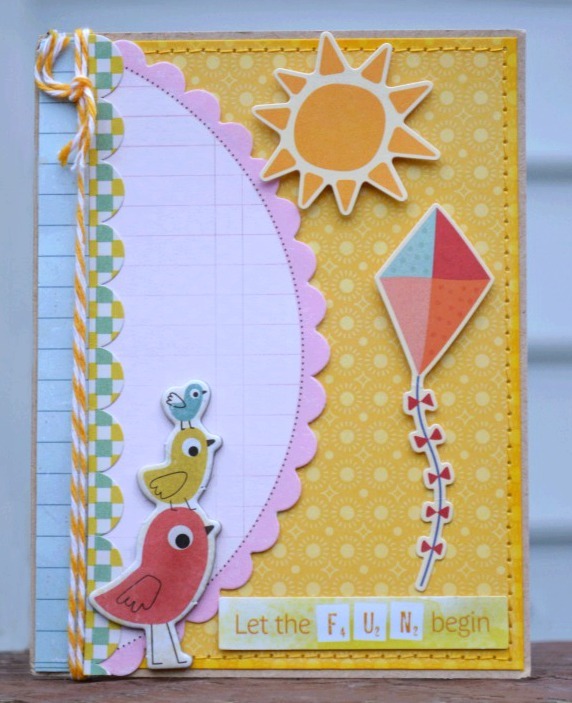 I nearly stopped there, but then decided the sun and kite stickers from My Little Shoebox would add just the right touch of whimsy. There, now the card feels complete. 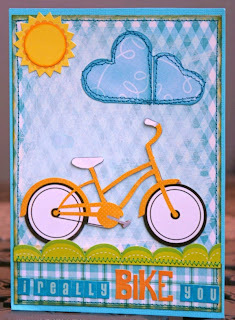 The second card, "I Really Bike You," features Echo Park’s paper and stickers. I love orange and blue together and took advantage of that combination here. To make the bicycle pop against the background, I whitewashed the paper with thin white acrylic paint. I used heart punches to make the clouds then sewed them on the card to make them look a bit puffy. 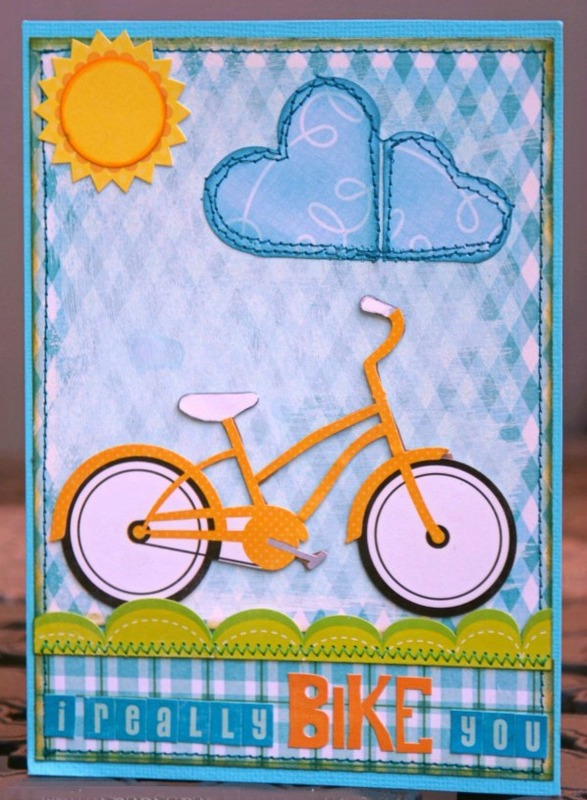 The sun sticker had a sentiment that didn’t fit the card, so I covered the wording by adding a plain yellow circle on top, then added my own sentiment with alphas under the bicycle. 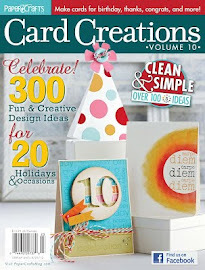 I submitted this card to Scrapbook & Cards Today, the terrific quarterly Canadian magazine, and was delighted to see my card featured on its blog here. I hope you're having a beautiful spring day wherever you are. 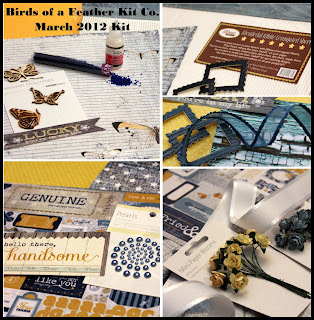 I’m so excited this month to be a guest designer for Birds of a Feather Kit Co. 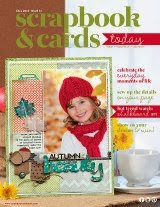 I had designed for BOAF last year and was thrilled when Amy, the owner, invited me back to work with the March kit. I tell you: I was given a great month for my stint because this kit is jam packed with beauties from Authentique and My Mind’s Eye. I hadn’t worked with Authentique before. I was so impressed with the beautiful papers. Not only did they look good, but they felt great too. The kit included the Genuine collection and the denim themed papers were easy to mix and match. 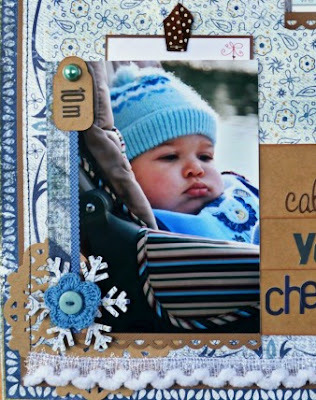 The nice heavy weight of this paper made me think of winter and I had this photo of my son as a baby in a knit hat, all cozy in his stroller, for an afternoon at the park. So I played on the winter theme. 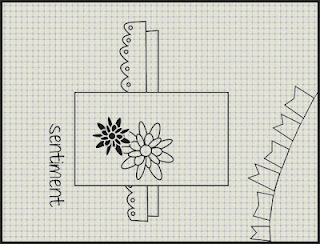 Just pretend those little flowers on the white paper are snowflakes, will ya? The background is one sheet of paper, Dependable. I used the A side (navy side) of Dependable for the outer frame, then carefully cut out the inner frame and flipped it to the B side (white side). I used a square of cardstock in between to hide where I had cut the paper, then stitched it all back together. I loved that the stiped paper in the kit (used as a banner here) mimicked the stripe in my son's stroller. Perfect! The Webster's trim is from a previous kit. It looked so cozy and was perfect here. When my son was a baby, we nicknamed him, "Cheeks." I think you can see why, lol. The March Birds of a Feather kit proved to be the most popular kit in the history of the club, selling out in less than 48 hours. This is a photo collage of the kit that BOAF sent me. I can hardly wait to see what Amy has in store for the April kit. If you are interested in a kit club, check out Birds of a Feather here. 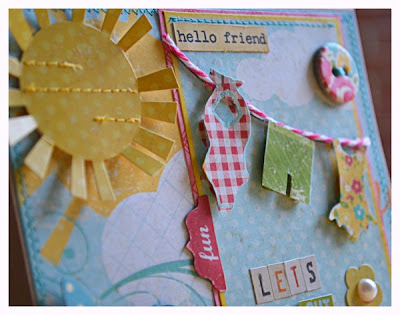 The site also has a terrific forum with super friendly paper crafters and lots of great inspiration. You can find the Hen House here. 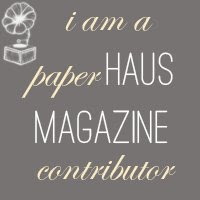 I’m super excited to have joined the Creative Team at Paper Issues, an Etsy store and challenge blog. 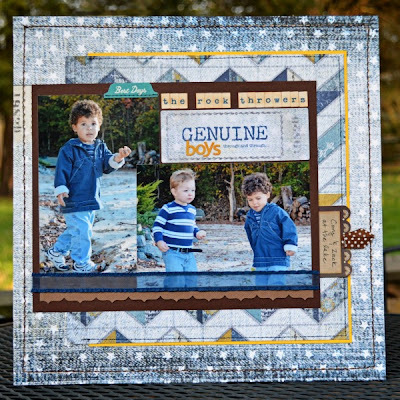 There's such a variety of paper crafters on the team and you'll find tons of fun and inspiration on the PI blog and often prizes, too. We post a different theme every other week and everyone can play along. We hope you'll join us! 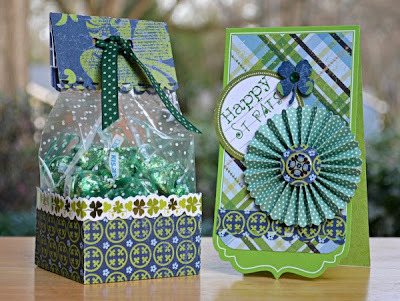 Our current theme is “ Go Green or Go Home.” For this you can use the color green, something recycled or something home inspired. Since St. Patrick’s Day is around the corner, I decided to upcycle a treat box - green, of course - for the holiday and include a coordinating card. To make the treat bag, I recycled a Martha Stewart paper container. The box was 3 inches on each side, the perfect dimensions for a 12-inch sheet of patterned paper. I used the Lucky Me line from Little Yellow Bicycle. I cut a strip of patterned paper 2 inches high by 12 inches long and scored it every 3 inches. I adhered the scored strip to the Martha Stewart box, then used a 12-inch border sticker around the top of the patterned paper. 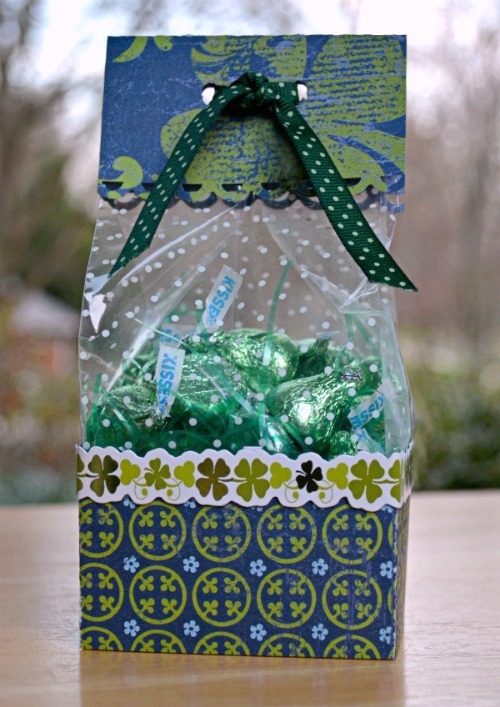 I added a cellophane bag into the base, filling it with green Hershey’s kisses. Then I folded the cellophane bag over and added a simple topper made from patterned paper. To complete the project, I used a cropadile to punch holes in the topper and threaded through a bit of ribbon. 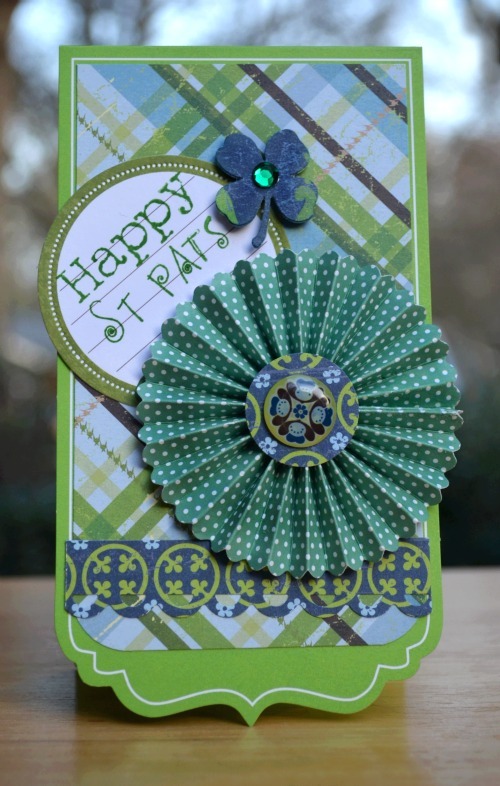 To make the card, I used a Doodlebug die cut as my base, adding some Lucky Me patterned paper, an accordion flower from LYB's Paradise collection and a round journaling spot for the sentiment. We’d love to have you play along in this challenge. 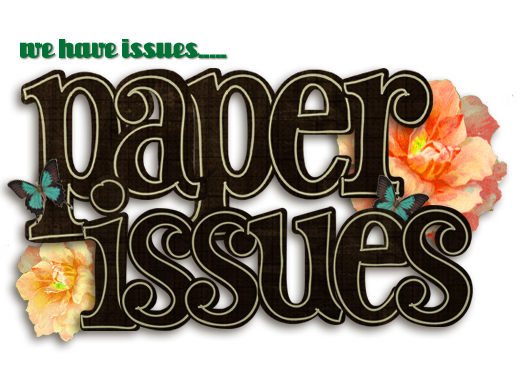 Just link up to the Paper Issues blog by March 17. 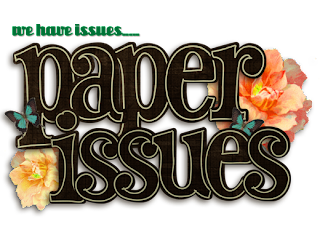 A little more about my new team: The Paper Issues creative team includes a wide variety of paper crafters including: traditional scrapbookers, card makers, altered art artists, art journal keepers, Project Lifers, SMASHers, crazy junk pilers, mist flickers and those who have mastered a cutting machine. The newest members of the creative team are: Aimee Maddern, Amy Tsuruta, Audrey Yeager, Christine Heeren, Cristin Drewes, Heather Leopard, Izzy Anderson (that's me), Kate Vickers, Leah Farquharson, Lizzie Oakley, Lori Wilbanks, Marlene Gomez, Missy Gener, Nina Yang, Patricia Roebuck and Sarah Andreotti. You can find the announcement here. 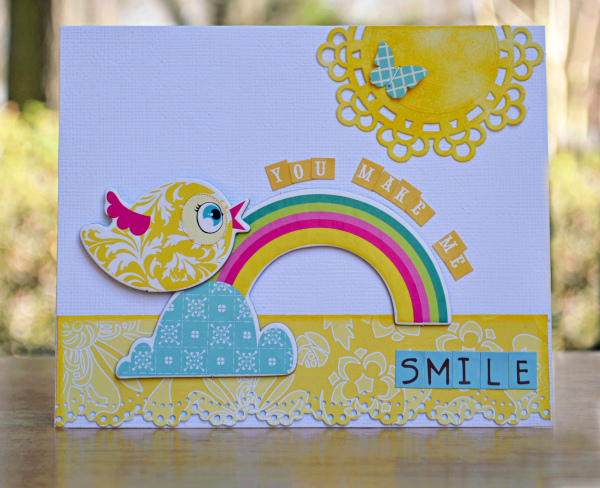 Cosmo Cricket has a challenge on its blog this week to make something happy and sunshiney using the color yellow. For every project made and linked to its blog or Facebook page, Cosmo Cricket will donate $5 and a can of food to their local food bank. How awesome is that? I think we should load them up with all things yellow! 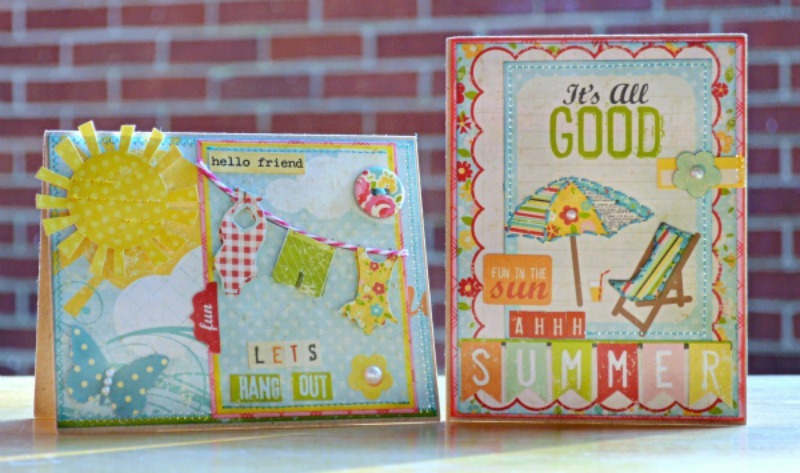 I really love the new Cosmo Cricket collections from Winter CHA, which feature wonderful shades of yellow. But those lines haven’t made it yet to a store near me. 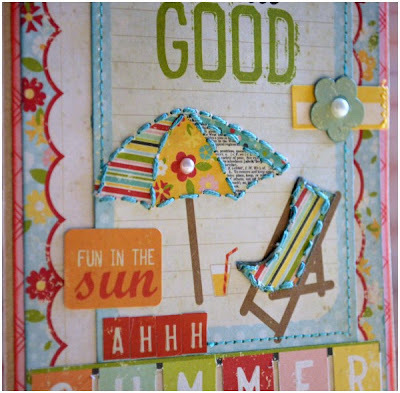 Instead, I pulled out some patterned paper and chipboard from Delovely, one of my favorite happy CC lines, and made a sunny card. The sun is a doily from Martha Stewart that I inked and misted and the little die cut butterfly is from Cosmo Cricket’s awesome “butterflies and doilies” that coordinated with its Social Club, Salt Air and Upcycle lines. 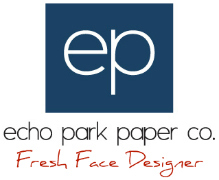 The stickers that spell “smile” are Echo Park. The yellow alphas are CC Tiny Type, which I have in every color. They are so handy! If you have a chance this weekend, rustle up your own yellow creation and send it over to Cosmo Cricket. The local food bank will be awfully glad you did.